The Queen is having another challenge… the theme this time is anything goes with a bit of green. The challenge runs for a month and has a amazing array of prizes! 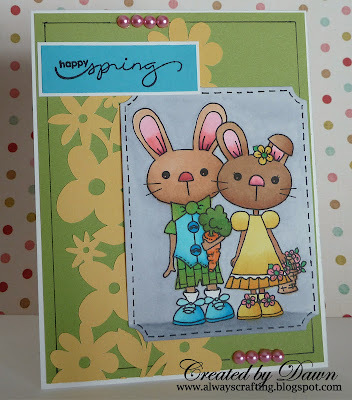 The image I used on this card is from Pixie Dust Studio called Some Bunny Loves You. This image is just adorable don't you think? Make sure to head over to The Scrapbooking Queen's Royal Court and enter into this challenge. This is such a cute image!! Lovely card, so glad I saw this on MIM! Such an adorable card creation. Love the bright colours and how the image has been coloured. Absolutely adorable card!! Those little bunnies are too sweet! Thank you for joining us at Love to Create Challenge this week! Such a Great Card! ADORABLE Thank you so much for joining us this week at Love to Create Challenge!! Come share your creativity & Join us again soon! So sweet Dawn and your colouring is gorgeous honey! Thx for linking up to the Make It Monday party!